The DEWALT 20V MAX* Red Rotary Laser has a durable design, adapters for use with tripods and brackets and allows users to use their existing power tool batteries for convenience. This laser features dual orientation: can be used both vertically and horizontally. It has a durable design with over-mold handles for slip resistance and drop protection. With removable 5/8" thread adaptor along with side and bottom ports. The Bosch GLL40-20G Self-Leveling Cross-Line Laser projects visible green laser lines, which are up to 4X brighter than standard red beams. The tool has a working range of up to 40 ft. and offers reliable accuracy of ±5/16 inch at 30 ft. It features Bosch-exclusive VisiMax technology, which monitors tool temperature and power consumption to deliver the brightest line for the job, optimized energy efficiency and long-term tool reliability. The cross-line laser is also equipped with a Smart Pendulum System allowing for automatic self-leveling and indication of out-of-level condition, as well as pendulum lock for safe tool transport. The included MM 2 Flexible Mounting Device provides a rotating 360° neck for quick setup and simple fine-tuning allowing for the laser to be clamped onto virtually any surface from 1/2 inch to 2-1/4 inch thick. 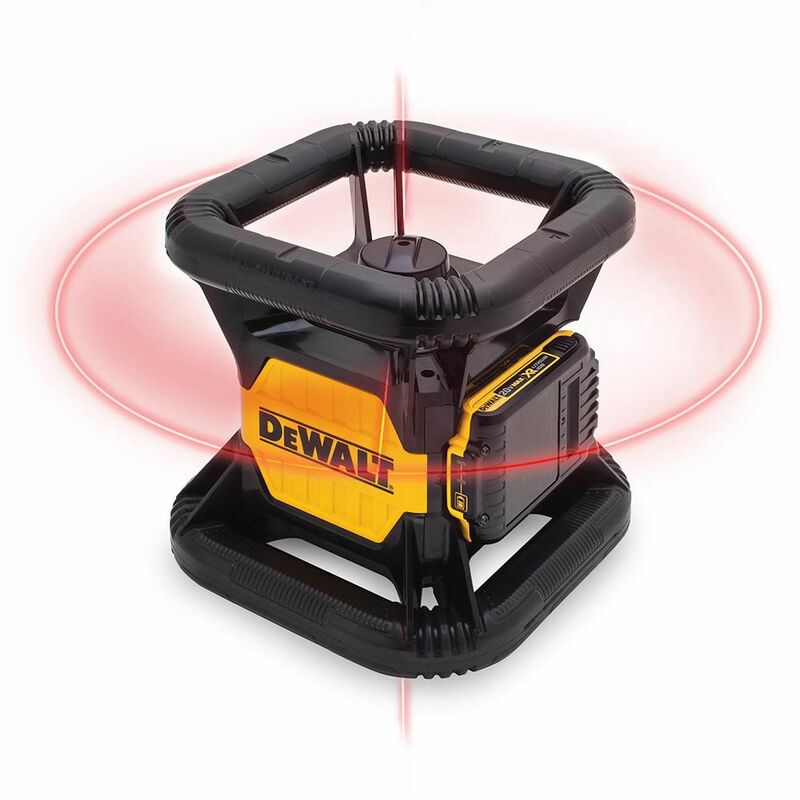 20V MAX Red Rotary Laser The DEWALT 20V MAX* Red Rotary Laser has a durable design, adapters for use with tripods and brackets and allows users to use their existing power tool batteries for convenience. This laser features dual orientation: can be used both vertically and horizontally. It has a durable design with over-mold handles for slip resistance and drop protection. With removable 5/8" thread adaptor along with side and bottom ports. 20V MAX Red Rotary Laser is rated 4.0 out of 5 by 3. Rated 4 out of 5 by Averagejoe from Great product battery system is awesome!! Only drawback is the ribs on upper protection ring can ... Great product battery system is awesome!! Only drawback is the ribs on upper protection ring can get in the way. So you may need to move the pickup a small amount left or right. The case system (tsak) is sweet. will this unit work outside in daylight, as a transit, to do yard levelling? Is there a tripod and measure stick also available ? The laser would be difficult to see outside in the daylight even with the glasses. Anyone able to tell me if this laser comes with one of Dewalt's tough system cases? Yes, there is a (1) DEWALT TSTAK kit box included with our DW074LR.